Gratitude is a choice. If we fail to chose it, by default we choose ingratitude. And once allowed into the heart, ingratitude does not come by itself, but with other seedy companions that only succeed in stealing joy. To not choose gratitude is more costly than we usually realize. When we do choose a lifestyle of heartfelt, humble gratitude, we are mindful of the benefits received from our gracious Savior and those He has placed around us. Having just finished One Thousand Gifts book and Bible study, I probably should have waited to read this book. They are very similar and Nancy encourages being grateful and showing others gratitude. 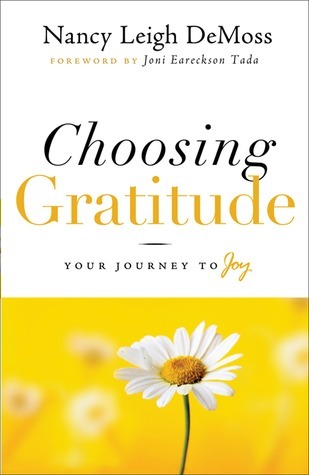 I think what I enjoyed about this book is that while being grateful to God she also explains how much others appreciate being thanked or shown gratefulness. It's a part of being polite but it's also deeper than that. Do you just write thank you cards because you have to or because you really want to? I thought the book to be a bit much all at once and read a bit each day. Some parts were nothing new and a few times I got a bit bored. I really love this concept and I think it's wonderful if we really do strive to be grateful. I recommend if you need a new perspective and this would be a good morning devotional.